If I was to tell you I had £65 and I wanted to buy a tablet, your answer would probably be “don’t bother!”. And few months ago you were right. With £65 the only option was a crappy low-end Chinese tablet available on Amazon. Times have changed and now with £65 you can buy an outstanding 7” tablet. A while ago I reviewed the big Linx 10 and I said that you couldn’t get a better tablet for £165. This time I will say that yo u can’t get a better tablet for £65, which let’s be honest, is very appealing! 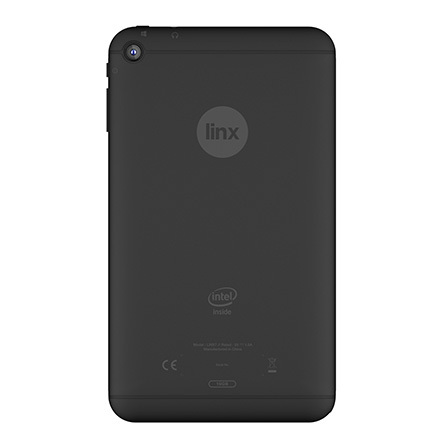 It’s only the price that is low end with the Linx 7 because this tablet is good in a lot of aspects. You will be really surprised when you hold the Linx 7 for the first time. It’s a really sturdy tablet. Like its bigger sister (the Linx 10), this tablet is black, really black. If you are looking for a colourful tablet...I’m afraid you will have to look somewhere else. The Linx 7 feels solid, the volume rocker and power button are well designed and much better than the one you can find on the Nexus 9. The design is quite boring to be honest, but this is a Windows product at the end of the day. I am really surprised how good quality the Linx 7 is and it feels better than a Samsung Galaxy Tab 4 or any Acer/Asus tablet. In an era of full HD display, it was obvious that Linx/Exertis had to do something to save money. As a result we have an 800x1280 Capacitive IPS display. The screen is not bad at all. It is bright (Windows 8 is very colourful) and has very good viewing angles. This is not an iPad Air display, but for £65 you get a bright and nice IPS display that is perfect for all your needs at home or at the office. In fact the Linx 7 display is better than a lot of laptops! Don’t expect an outstanding sound like the Kindle Fire HDX. The sound is just ok. I would advise you to use headphones. There are two cameras. Yes for £65 you get two cameras! The front facing camera has a 2MP resolution. It’s ok for Skype, actually Skype works very well with the Linx 7. The rear camera has a 2MP resolution too. Welcome back to 2001! You will never win new followers on Instagram with this rear camera but it is ok in case of emergency. The Linx 7 is not designed for multimedia but you can use this tablet for watching movies, listening to music and the experience will be perfectly fine. This is where you feel this tablet is a low end. The battery is not great and will only last 4-5 hours. That’s very poor but at £65 you cannot expect much more. Charging is not fast either I’m afraid. The Intel Atom Quad Core Processor (1.83 Ghz) is powerful and well optimised for Windows 8.1. Trust me you won’t believe how snappy this little and ultra-affordable tablet is. As this tablet runs a full version of Windows 8.1 you can install Google Chrome, iTunes, Firefox etc….. everything works perfectly fine. It comes with 32GB and a Micro SD card reader so you have plenty of storage. But there is even more good news in Linxland! You get a 1 year free subscription for Office 365 and an enormous 1TB free storage on One Drive, the excellent cloud solution from Microsoft. Unfortunately Office is still not fully optimised for touch screen so the experience won’t be the best, but it is ok if you want to edit some documents on the go. I have used a lot of tablets in the past and I have always found that affordable Android tablets are not really great performers (except the Nexus 7). But this tablet is snappy, fast, and you get an outstanding performance for £65! We cannot talk about a tablet without mentioning the App situation. So what about the Windows App Store? Growing step by step. It is still far behind the Apple Store and Google Play, but this is a full Windows tablet so you can use the browser instead. And if you install Chrome you can get all the apps you are enjoying on your Chromebook. Windows 8 is not really about apps, it is more focused on productivity and work. So, the app store is nothing to be really excited about, but it is ok.
My answer is absolutely YES! If you already have a tablet and if you are curious about Windows...you can’t go wrong with the Linx 7. It is an excellent tablet for the price. If you haven’t got a tablet and you are looking to buy your first tablet (and if you’re on a budget), don’t hesitate. If you want a premium tablet full of apps etc…, I don’t think this is for you but I would recommend you try it. If you don’t like it...send it back within 30 days. Linx/Exertis surprised me with the Linx 10, but they have done even better work with the Linx 7. This is an outstanding tablet for less than £70. It has a good display, sturdy design, excellent performance, 2 cameras (not the best though). The battery is poor but there is many more pros than cons and you will be very surprised with this tablet. Congratulation Linx! Many thanks and enjoy this tablet!